Gifts from the Pirates: "And what about those parcels there are they all meant for me? I must unwrap them straight away oh, i cant wait to see." "And what about those parcels there are they all meant for me? I must unwrap them straight away oh, i cant wait to see." All has been quiet in the giftsfromthepirates house since Friday. We've all been poorly with pretty awful gastric stomach bugs, so the house had been quarantined and everything was on lock down. Typical that it would happen over Mrs M's birthday. 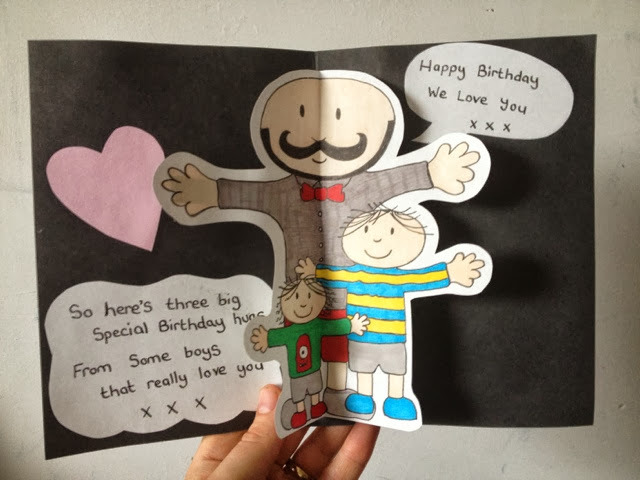 It didn't stop us making a nice birthday card though, Opeie added his usual bit of care creative flair. When making cards for Mrs M I always try to include the characters from the engagement book I wrote. I'd like to use them all in years to come to make another book that she can keep. As I sat and drew Opeie happily sat next to me doodling away, he's started getting into his drawing more lately which I love and am fully motivating, its about time his creative side came out. I really wanted Mrs M's card to be a pop up card but soon gave up on an intricate pop up scene, if you've ever tried to work out the schematics of a pop up card you'll know what i mean, still feeling rough though didn't help, I just couldn't get my head round it. We went for something less dramatic but it was still very cute and was loved by Mrs M.